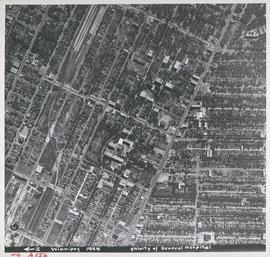 Description (on recto): WG A156, vicinity of General Hospital, Winnipeg, 1944. - Area around William Avenue and Sherbrook Street shown in photograph. - Photo credit: Royal Canadian Air Force Photograph. Date of photograph is approximate, ca. 1935. Inscription (on recto): WG M35: 7-16, 5 Mar '45, Assiniboine to Airport, St. James, app scale 1/12000. Inscription (on recto): WG A114 30-2-42 CPR [Canadian Pacific Railway] RR [Railroad] Yards looking West. Inscription (on recto): WG M35: 3-8, 5 Mar '45, CNR Yards Wpg, appr scale 1/12000. Date of photograph is approximate, ca. 1947. Inscription (on recto): WG A158 8/6/1942 Central Wpg between Portage and Notre Dame Ave's.